I don’t often dress up for Halloween anymore. I’m the dad who’s trailing his little kids and making sure they’re staying safe. One year, I went as a full blown stormtrooper. I worked for six weeks with a friend putting the costume together and custom fitting it to my body. It looked amazing and was to the exact specifications of what you see in the Star Wars movies. The problem? It didn’t allow me to be a dad. Despite how it looks in the movies, it’s really hard to move in those things. And forget sitting down. My wife forbid me to wear it out the kids ever again, but this year she came up with a great way to modify it to allow me mobility and maximum cool (well, as much cool as can be achieved when one is geeking out so hard they have a custom fit stormtrooper costume): a stormtrooper dressed as a man. I took it just a bit further and came up with this, Prohibition-Era Stormtrooper Gangster! 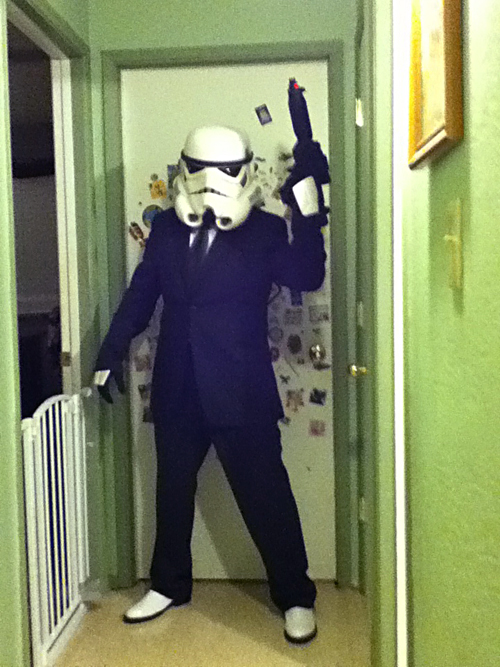 I say Prohibition-Era Stormtrooper Silence! Sorry, but it very much reminds me of Doctor Who. Way cool though! Pure genius! I think this is one of the coolest things ever. If this photo doesn’t go viral, I’m a poor judge of what will go viral. Love in it man. The shoes are the big seller to this piece. Nice job. Have a fun and safe Halloween. Thanks, everybody! I should have more pictures tonight. Better ones. Bugs me you can’t see the pinstripes. I love this!!!! Best costume ever!! That is @#$%ing pimp. Anyone tells you otherwise and I’ll mysteriously appear in the nick of time to kick them in the appendix. Thus saving the day. I’m happy to report that my costume was met with a good reception when I took it to the streets. I don’t know if anyone “got it,” but it was respected. I even freaked out a few little kids. The outfit and pose remind me of Pulp Fiction. That’s awesome.